"Inca" redirects here. 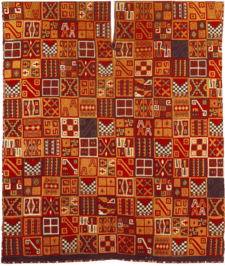 For a general view of Inca civilization, people and culture, see Andean civilizations. For other uses, see Inca (disambiguation). Languages Quechua (official), Aymara, Puquina, Jaqi family, Muchik and scores of smaller languages. The Inca Empire (Quechua: Tawantinsuyu, lit. "The Four Regions"), also known as the Incan Empire and the Inka Empire, was the largest empire in pre-Columbian America, and possibly the largest empire in the world in the early 16th century. The administrative, political and military center of the empire was located in Cusco in modern-day Peru. 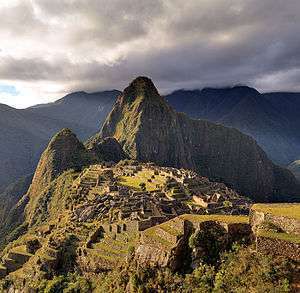 The Inca civilization arose from the highlands of Peru sometime in the early 13th century. Its last stronghold was conquered by the Spanish in 1572. From 1438 to 1533, the Incas used methods including conquest and peaceful assimilation, to incorporate a large portion of western South America, centered on the Andean mountain ranges. At its largest, the empire joined Peru, large parts of modern Ecuador, western and south central Bolivia, northwest Argentina, north and central Chile and a small part of southern Colombia into a state comparable to the historical empires of Eurasia. Its official language was Quechua. Many local forms of worship persisted in the empire, most of them concerning local sacred Huacas, but the Inca leadership encouraged the worship of Inti—their sun god—and imposed its sovereignty above other cults such as that of Pachamama. 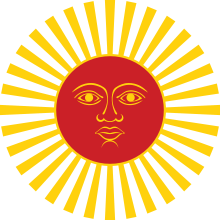 The Incas considered their king, the Sapa Inca, to be the "son of the sun." The term Inka means "ruler" or "lord" in Quechua and was used to refer to the ruling class or the ruling family. The Spanish adopted the term (transliterated as Inca in Spanish) as an ethnic term referring to all subjects of the empire rather than simply the ruling class. As such the name Imperio inca ("Inca Empire") referred to the nation that they encountered and subsequently conquered. Under the leadership of Manco Cápac, the Inca formed the small city-state Kingdom of Cusco (Quechua Qusqu', Qosqo). In 1438, they began a far-reaching expansion under the command of Sapa Inca (paramount leader) Pachacuti-Cusi Yupanqui, whose name literally meant "earth-shaker". The name of Pachacuti was given to him after he conquered the Tribe of Chancas (modern Apurímac). During his reign, he and his son Tupac Yupanqui brought much of the Andes mountains (roughly modern Peru and Ecuador) under Inca control. 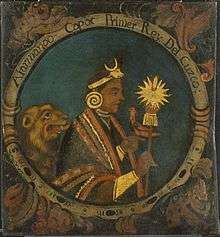 Túpac Inca's son Huayna Cápac added a small portion of land to the north in modern-day Ecuador and in parts of Peru. At its height, the Inca Empire included Peru and Bolivia, most of what is now Ecuador and a large portion of what is today Chile, north of the Maule River. The advance south halted after the Battle of the Maule where they met determined resistance from the Mapuche. The empire's push into the Amazon Basin near the Chinchipe River was stopped by the Shuar in 1527. The empire extended into corners of Argentina and Colombia. However, most of the southern portion of the Inca empire, the portion denominated as Qullasuyu, was located in the Altiplano. When they returned to Peru in 1532, a war of brothers between the sons of Huayna Capac, Huáscar and Atahualpa, and unrest among newly conquered territories weakened the empire. Perhaps more importantly, smallpox had spread from Central America. Pizarro did not have a formidable force. With just 168 men, one cannon, and 27 horses, he often talked his way out of potential confrontations that could have easily wiped out his party. The Spanish horsemen, fully armored, had technological superiority over the Inca forces. The traditional mode of battle in the Andes was a kind of siege warfare where large numbers of usually reluctant draftees were sent to overwhelm opponents. The Spaniards developed one of the finest military machines in the premodern world, tactics learned in their centuries-long fight against Moorish kingdoms in Iberia. Along with their tactical and material superiority, the Spaniards acquired tens of thousands of native allies who sought to end the Inca control of their territories. 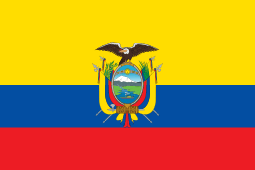 Their first engagement was the Battle of Puná, near present-day Guayaquil, Ecuador, on the Pacific Coast; Pizarro then founded the city of Piura in July 1532. Hernando de Soto was sent inland to explore the interior and returned with an invitation to meet the Inca, Atahualpa, who had defeated his brother in the civil war and was resting at Cajamarca with his army of 80,000 troops. Pizarro and some of his men, most notably a friar named Vincente de Valverde, met with the Inca, who had brought only a small retinue. Through an interpreter Friar Vincente read the "Requerimiento" that demanded that he and his empire accept the yoke of King Charles I of Spain and convert to Christianity. Because of the language barrier and perhaps poor interpretation, Atahualpa became somewhat puzzled by the friar's description of Christian faith and was said to have not fully understood the envoy's intentions. After Atahualpa attempted further enquiry into the doctrines of the Christian faith, the Spanish became frustrated and impatient. They attacked the Inca's retinue and captured Atahualpa as hostage. The effects of smallpox on the Inca empire were even more devastating. Beginning in Colombia, smallpox spread rapidly before the Spanish invaders first arrived in the empire. The spread was probably aided by the efficient Inca road system. Within a few years smallpox claimed between 60% and 94% of the Inca population, with other waves of European disease weakening them further. Smallpox was only the first epidemic. Typhus (probably) in 1546, influenza and smallpox together in 1558, smallpox again in 1589, diphtheria in 1614, measles in 1618 – all ravaged the Inca people. The number of people inhabiting Tawantinsuyu at its peak is uncertain, with estimates ranging from 4-37 million. 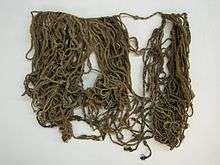 In spite of the fact that the Inca kept excellent census records using their quipu, knowledge of how to read them was lost and almost all of them were destroyed by the Spaniards. 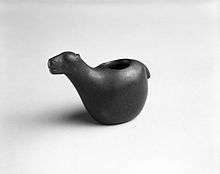 Since the Inca Empire lacked a written language, the main form of communication and recording in the empire were quipus, ceramics and spoken Quechua, the language the Incas imposed upon the peoples within the empire. The plethora of civilizations in the Andean region provided for a general disunity that the Incas had to subdue in order to maintain control. While Quechua had been spoken in the Andean region, including central Peru, for several centuries prior to the expansion of the Inca civilization, the dialect of Quechua the Incas imposed was an adaptation from the Kingdom of Cusco (an early form of "Southern Quechua" originally named Qhapaq Runasimi, or 'the great language of the people'), or what some historians define as the Cusco dialect. 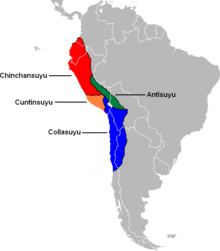 Although most of the societies within the empire accepted Quechua, the Incas allowed several societies to keep their original languages, such as Aymara, which remains in use in contemporary Bolivia, where it is the primary indigenous language and in various regions surrounding Bolivia. The linguistic body of the Inca Empire was thus varied. The Inca's impact outlasted their empire, as the Spanish continued the use of Quechua. The Inca believed in reincarnation. Death was a passage to the next world that was full of difficulties. The spirit of the dead, camaquen, would need to follow a long road and during the trip the assistance of a black dog that could see in the dark was required. Most Incas imagined the after world to be like that of the European notion of heaven, with flower-covered fields and snow-capped mountains. 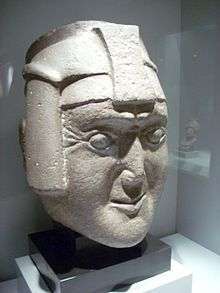 Manco Cápac – known for his courage and sent to earth to become first king of the Incas. Taught people how to grow plants, make weapons, work together, share resources and worship the Gods. The Inca Empire employed central planning. The Inca Empire traded with outside regions, although they did not operate a substantial internal market economy. While axe-monies were used along the northern coast, presumably by the provincial mindaláe trading class, most lived in a traditional economy in which households were required to pay taxes both in kind (e.g., crops, textiles, etc.) and in the form of the mit'a corvée labor and military obligations, though barter (or trueque) was present in some areas. In return, the state provided security, food in times of hardship through the supply of emergency resources, agricultural projects (e.g. aqueducts and terraces) to increase productivity and occasional feasts. The economy rested on the material foundations of the vertical archipelago, a system of ecological complementarity in accessing resources and the cultural foundation of ayni, or reciprocal exchange. The Sapa Inca was conceptualized as divine and was effectively head of the state religion. The Willaq Umu (or Chief Priest) was second to the emperor. Local religious traditions continued and in some cases such as the Oracle at Pachacamac on the Peruvian coast, were officially venerated. 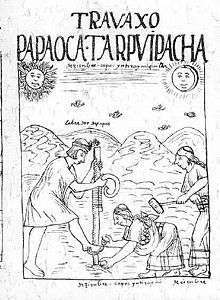 Following Pachacuti, the Sapa Inca claimed descent from Inti, who placed a high value on imperial blood; by the end of the empire, it was common to incestuously wed brother and sister. 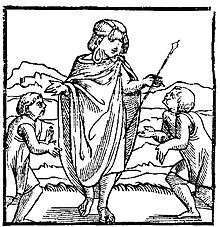 He was "son of the sun," and his people the intip churin, or "children of the sun," and both his right to rule and mission to conquer derived from his holy ancestor. The Sapa Inca also presided over ideologically important festivals, notably during the Inti Raymi, or "warriors' cultivation," attended by soldiers, mummified rulers, nobles, clerics and the general population of Cusco beginning on the June solstice and culminating nine days later with the ritual breaking of the earth using a foot plow by the Inca. 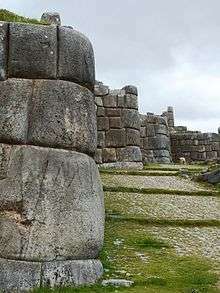 Moreover, Cusco was considered cosmologically central, loaded as it was with huacas and radiating ceque lines and geographic center of the Four Quarters; Inca Garcilaso de la Vega called it "the navel of the universe". Cusco was likely not organized as a wamani, or province. Rather, it was probably somewhat akin to a modern federal district, like Washington, D.C. or Mexico City. The city sat at the center of the four suyu and served as the preeminent center of politics and religion. 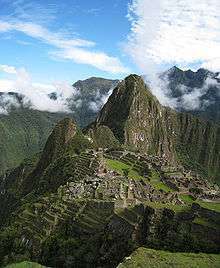 While Cusco was essentially governed by the Sapa Inca, his relatives and the royal panaqa lineages, each suyu was governed by an Apu, a term of esteem used for men of high status and for venerated mountains. Both Cusco as a district and the four suyu as administrative regions were grouped into upper hanan and lower hurin divisions. As the Inca did not have written records, it is impossible to exhaustively list the constituent wamani. However, colonial records allow us to reconstruct a partial list. There were likely more than 86 wamani, with more than 48 in the highlands and more than 38 on the coast. The largest suyu by area was Qullasuyu, named after the Aymara-speaking Qulla people. It encompassed the Bolivian Altiplano and much of the southern Andes, reaching Argentina and as far south as the Maipo or Maule river in Central Chile. Historian José Bengoa singled out Quillota as perhaps the foremost Inca settlement. Colonial sources are not entirely clear or in agreement about Inca government structure, such as exact duties and functions of government positions. But the basic structure can be broadly described. The top was the Sapa Inca. Below that may have been the Willaq Umu, literally the "priest who recounts", the High Priest of the Sun. However, beneath the Sapa Inca also sat the Inkap rantin, who was a confidant and assistant to the Sapa Inca, perhaps similar to a Prime Minister. 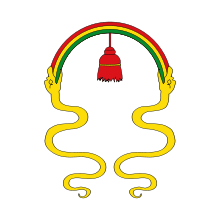 Starting with Topa Inca Yupanqui, a "Council of the Realm" waas composed of 16 nobles: 2 from hanan Cusco; 2 from hurin Cusco; 4 from Chinchaysuyu; 2 from Cuntisuyu; 4 from Collasuyu; and 2 from Antisuyu. This weighting of representation balanced the hanan and hurin divisions of the empire, both within Cusco and within the Quarters (hanan suyukuna and hurin suyukuna). This process was first used on a large scale by the Pucara (ca. 300 BC–AD 300) peoples to the south in Lake Titicaca and later in the city of Tiwanaku (ca. AD 400–1100) in present-day Bolivia. The rocks were sculpted to fit together exactly by repeatedly lowering a rock onto another and carving away any sections on the lower rock where the dust was compressed. The tight fit and the concavity on the lower rocks made them extraordinarily stable, despite the ongoing challenge of earthquakes and volcanic activity. Physical measures used by the Inca were based on human body parts. Units included fingers, the distance from thumb to forefinger, palms, cubits and wingspans. The most basic distance unit was thatkiy or thatki, or one pace. The next largest unit was reported by Cobo to be the topo or tupu, measuring 6,000 thatkiys, or about 7.7 km (4.8 mi); careful study has shown that a range of 4.0 to 6.3 km (2.5 to 3.9 mi) is likely. Next was the wamani, composed of 30 topos (roughly 232 km or 144 mi). To measure area, 25 by 50 wingspans were used, reckoned in topos (roughly 3,280 km2 or 1,270 sq mi). It seems likely that distance was often interpreted as one day's walk; the distance between tambo way-stations varies widely in terms of distance, but in far less in terms of time to walk that distance. Inca calendars were strongly tied to astronomy. Inca astronomers understood equinoxes, solstices and zenith passages, along with the Venus cycle. They could not, however, predict eclipses. The Inca calendar was essentially lunisolar, as two calendars were maintained in parallel, one solar and one lunar. As 12 lunar months fall 11 days short of a full 365-day solar year, those in charge of the calendar had to adjust every winter solstice. Each lunar month was marked with festivals and rituals. Apparently, the days of the week were not named and days were not grouped into weeks. Similarly, months were not grouped into seasons. Time during a day was not measured in hours or minutes, but in terms of how far the sun had travelled or in how long it takes to perform a task. Almost all of the gold and silver work of the Incan empire was melted down by the conquistadors. The Inca army was the most powerful at that time, because they could turn an ordinary villager or farmer into a soldier. Every male Inca had to take part in war at least once to prepare for warfare again when needed. By the time the empire reached its largest size, every section of the empire contributed in setting up an army for war. Roads allowed quick movement (on foot) for the Inca army and shelters called tambo were built one day's distance in travelling from each other, so that an army on campaign could always be fed and rested. This can be seen in names of ruins such as Ollantay Tambo, or My Lord's Storehouse. These were set up so the Inca and his entourage would always have supplies (and possibly shelter) ready as they traveled. Andean civilization probably began c. 7600 BCE. Based in the highlands of Peru, an area now called the punas, the ancestors of the Incas probably began as a nomadic herding people. Adaptation to the altitude led to distinctive physical developments. Short and stocky, men averaged 1.57 m (5'2") and women 1.45 m (4'9"). Compared to other humans, the Incas had slower heart rates, almost one-third larger lung capacity, about 2 L (4 pints) more blood volume and double the amount of hemoglobin, which transfers oxygen from the lungs to the rest of the body. While the Conquistadors may have been slightly taller, the Inca had the advantage of coping with the extraordinary altitude. Permanent habitations have been found as high as 5,300 m (17,400 ft) above sea level in the temperate zone of the high altiplanos. In the Lake Titikaka region, Tiwanaku is recognized by Andean scholars as one of the most important precursors to the Inca Empire, flourishing as the ritual and administrative capital of a major state power for approximately 500 years. Previous cultures left no written record, but their architecture, ceramics and state government were inherited by the Inca. 1 2 McEwan 2008, p. 221. ↑ Schwartz, Glenn M.; Nichols, John J. (15 August 2010). After Collapse: The Regeneration of Complex Societies. University of Arizona Press. ISBN 978-0-8165-2936-0. ↑ "The Inca - All Empires". ↑ "The Inca." The National Foreign Language Center at the University of Maryland. 29 May 2007. Retrieved 10 Sept 2013. ↑ McEwan 2008, p. 57. ↑ McEwan 2008, p. 69. ↑ Starn, Orin; Kirk, Carlos Iván; Degregori, Carlos Iván (1 January 2009). The Peru Reader: History, Culture, Politics. Duke University Press. ISBN 0-8223-8750-6. Juan de Samano (9 October 2009). "Relacion de los primeros descubrimientos de Francisco Pizarro y Diego de Almagro, 1526". bloknot.info (A. Skromnitsky). Retrieved 10 October 2009. ↑ Somervill, Barbara (2005). Francisco Pizarro: Conqueror of the Incas. Compass Point Books. p. 52. ISBN 978-0-7565-1061-9. ↑ McEwan 2008, p. 79. ↑ McEwan 2008, p. 31. ↑ Sanderson 1992, p. 76. ↑ McEwan 2008, pp. 93–96. ↑ Quechua Archived 12 October 2008 at the Wayback Machine. 1 2 3 "Origins And Diversity of Quechua". ↑ Moseley 2001, p. 44. ↑ D'Altroy 2014, pp. 86-89; 111; 154-155. ↑ McEwan 2008, p. 138-139. 1 2 Dillehay, T.; Gordon, A. "La actividad prehispánica y su influencia en la Araucanía". In Dillehay, Tom; Netherly, Patricia. La frontera del estado Inca. Editorial Abya Yala. ISBN 978-9978-04-977-8. ↑ Bengoa 2003, p. 39. ↑ D'Altroy 2014, pp. 42-43, 86-89. ↑ McEwan 2008, p. 113-114. ↑ Bengoa 2003, pp. 37–38. ↑ D'Altroy 2014, pp. 87. ↑ D'Altroy 2014, pp. 87-88. ↑ D'Altroy 2014, pp. 235-236. ↑ D'Altroy 2014, pp. 99. ↑ Zuidema 1983, pp. 48. ↑ Julien 1982, pp. 121-127. 1 2 D'Altroy 2014, pp. 233-234. ↑ McEwan 2008, p. 114-115. ↑ Julien 1982, p. 123. ↑ D'Altroy 2014, pp. 233. ↑ D'Altroy 2014, pp. 246-247. ↑ McEwan 2008, p. 179-180. ↑ D'Altroy 2014, pp. 150-154. ↑ McEwan 2008, p. 185-187. ↑ McEwan 2008, p. 183-185. ↑ "Supplementary Information for: Heggarty 2008". Arch.cam.ac.uk. Retrieved 2012-09-24. ↑ "Inca mathematics". History.mcs.st-and.ac.uk. Retrieved 2012-09-24. ↑ McEwan 2008, p. 185. ↑ Sáez-Rodríguez, A. (2012). "An Ethnomathematics Exercise for Analyzing a Khipu Sample from Pachacamac (Perú)". Revista Latinoamericana de Etnomatemática. 5 (1): 62–88. ↑ Berrin, Kathleen (1997). The Spirit of Ancient Peru: Treasures from the Museo Arqueológico Rafael Larco Herrera. Thames and Hudson. ISBN 978-0-500-01802-6. ↑ McEwan 2008, p. 183. ↑ "Incan skull surgery". Science News. 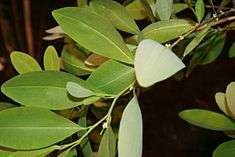 1 2 "Cocaine's use: From the Incas to the U.S.". Boca Raton News. 4 April 1985. Retrieved 2 February 2014. ↑ Francisco López de Jerez,Verdadera relacion de la conquista del Peru y provincia de Cusco, llamada la Nueva Castilla, 1534. ↑ Guaman Poma, El primer nueva corónica y buen gobierno, (1615/1616), pp. 256, 286, 344, 346, 400, 434, 1077, this pagination corresponds to the Det Kongelige Bibliotek search engine pagination of the book. Additionally Poma shows both well drafted European flags and coats of arms on pp. 373, 515, 558, 1077, 0. On pages 83, 167–171 Poma uses a European heraldic graphic convention, a shield, to place certain totems related to Inca leaders. ↑ Preble, George Henry; Charles Edward Asnis (1917). Origin and History of the American Flag and of the Naval and Yacht-Club Signals... 1. N. L. Brown. p. 85. ↑ McCandless, Byron (1917). Flags of the world. National Geographic Society. p. 356. ↑ "¿Bandera gay o del Tahuantinsuyo?". Terra. 19 April 2010. 1 2 "La Bandera del Tahuantisuyo" (PDF) (in Spanish). Retrieved 12 June 2009. Bengoa, José (1 January 2003). 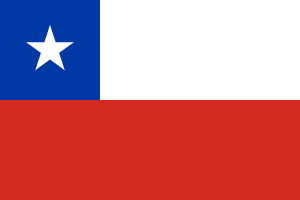 Historia de los antiguos mapuches del sur: desde antes de la llegada de los españoles hasta las paces de Quilín : siglos XVI y XVII. BPR Publishers. ISBN 978-956-8303-02-0. McEwan, Gordon F. (26 August 2008). The Incas: New Perspectives. W. W. Norton, Incorporated. pp. 221–. ISBN 978-0-393-33301-5.